My trip to Prague started out with my phone losing the Google Maps directions I had uploaded to help me get to my family’s hotel, so I had to wait on the steps of the Nicholas Church for half an hour for them to come get me. And my trip ended with me losing my phone somewhere between the hotel in Prague and my apartment in Dresden. 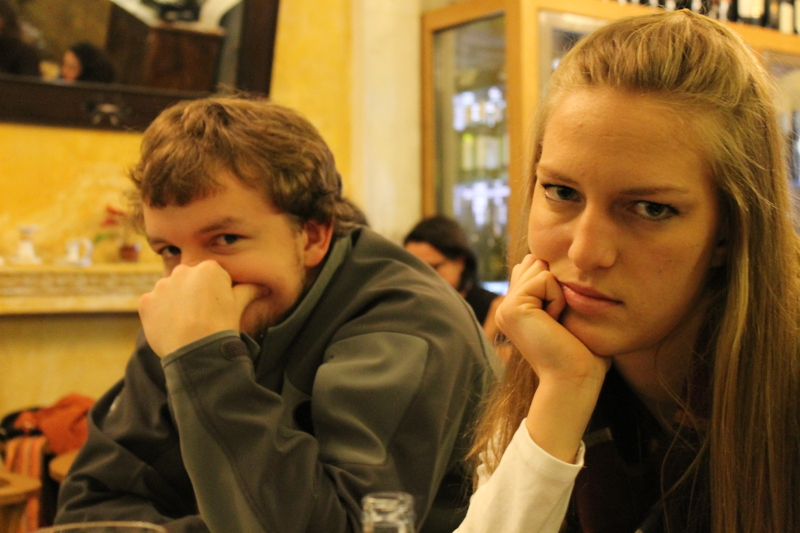 But between those two sad, phone-related occasions, I had a fantastic time with everyone in Prague! It was definitely a non-traditional Christmas, but in true Lord form we played cards, got lost several times per day, took lots of pictures, and generally had a good time! And in keeping with Swaintek tradition, we did drink a good amount of whiskey and beer, though it was not Yuengling. Day 1 was Christmas Eve. We started off the day with a boat tour departing from the famous Charles Bridge. Somehow, the tour was in both English and Russian, which was somewhat amusing. Everyone got their first taste of Glühwein, included with the tour, but it really was not all that great. 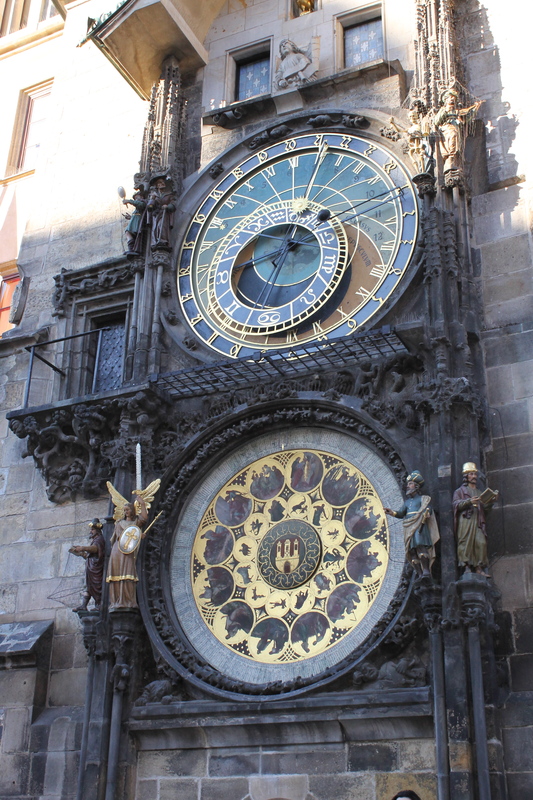 After the tour, we walked over to Old Town, which houses the famous astronomical clock on the side of Town Hall, as well as the main Christmas market and several churches of different architectural styles. 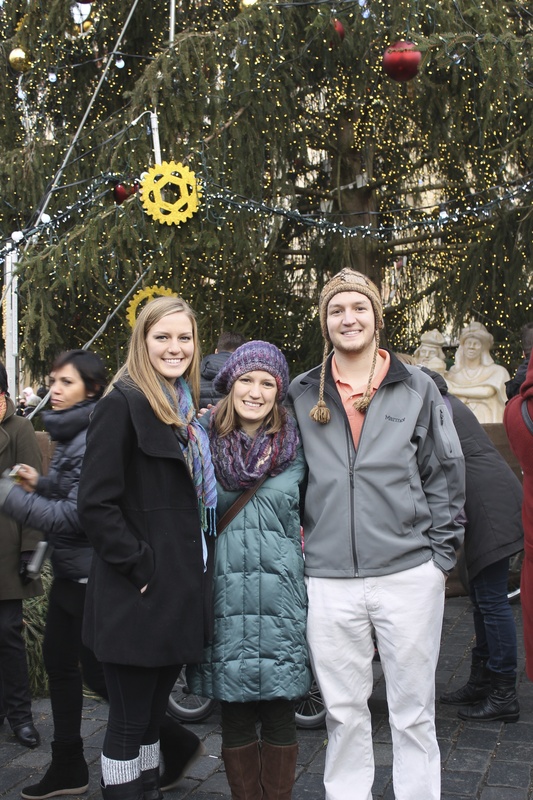 We shopped around at the Christmas market, enjoyed some Czech sausage and beer, and took photos in front of the giant, yet somehow incredibly sparse, Christmas tree in the center of the square. We also saw Wenceslas Square, which is basically a big shopping street and not all that exciting, yet some how we walked all the way over there several different times and managed to get lost almost every time! After finding a restaurant for our Christmas Eve dinner and making reservations for later that evening, we headed back to our hotel where we played Password (Colleen and my dad are the family Password champs; once, many Christmases ago, they scored ten points when Colleen correctly guessed “pineapple” after only one clue, “tropical.”), opened a few Christmas gifts, and drank my superior homemade Glühwein. Having had enough Czech food the previous evening, we enjoyed a delicious Italian meal in an adorable little restaurant apparently staffed by only 2 people that night! The next morning, we headed to Christmas Mass at the beautiful St. Thomas Church in the Lesser Town where we were staying. It was an English language Mass, and the priest appeared to be from New York! The rest of the family marveled at how cold the church was, but really it was quite comfortable for European standards… there were little heating vents on the back of every pew, which was a game changer. We ate lunch and made a quick stop in the other famous church in the neighborhood, Our Lady of Victory, which is better known as the home of the Infant of Prague. My dad and I took a quick climb up to the castle, which was quite near our hotel, and I tried to show him the Senate gardens, my favorite attraction from my last trip to Prague, but it turns out they’re not open during the winter! Later that evening, once it was dark, we climbed up to the top of the City Hall to enjoy beautiful, yet awkwardly crowded, views of the Old Town before descending again to catch the clock chiming 7! Every hour, the doors at the top of the clock open to reveal 12 circulating Apostles, while the skeleton figure on the clock dances to celebrate the passage of time and our impending deaths. Then a bugler appears at the top of the tower and plays for a few minutes! It’s pretty cool to see! As we started to make our way to our dinner reservations, we attempted to find a souvenir shop we had browsed in the previous day, which led to us becoming hopelessly lost and all 5 of us thinking we were in a different location of the city, though we were all wrong. Eventually we made it back in time for our reservations at a steakhouse called “Cowboys,” of all things; it was really very delicious, which you maybe wouldn’t expect of a steakhouse in Prague! 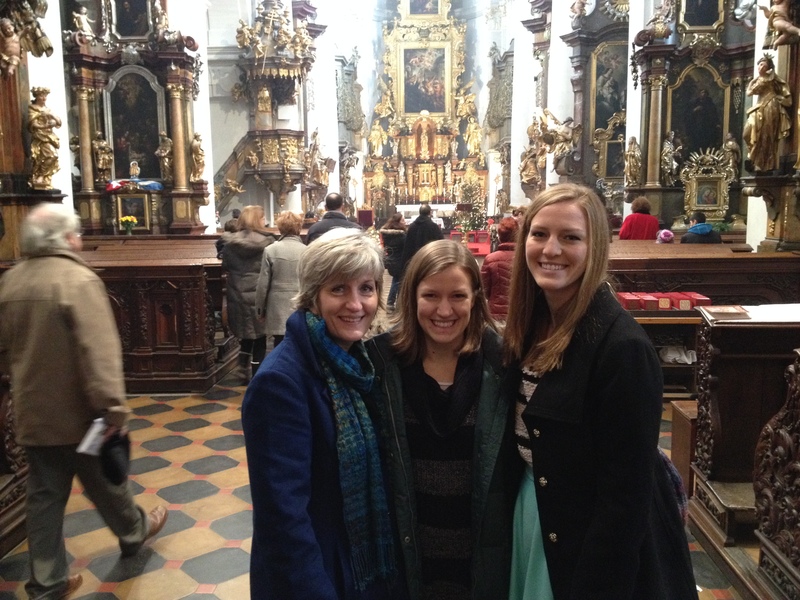 On the 26th, my mom and I made our way bright and early to Old Town to catch a tour about World War II in Prague. 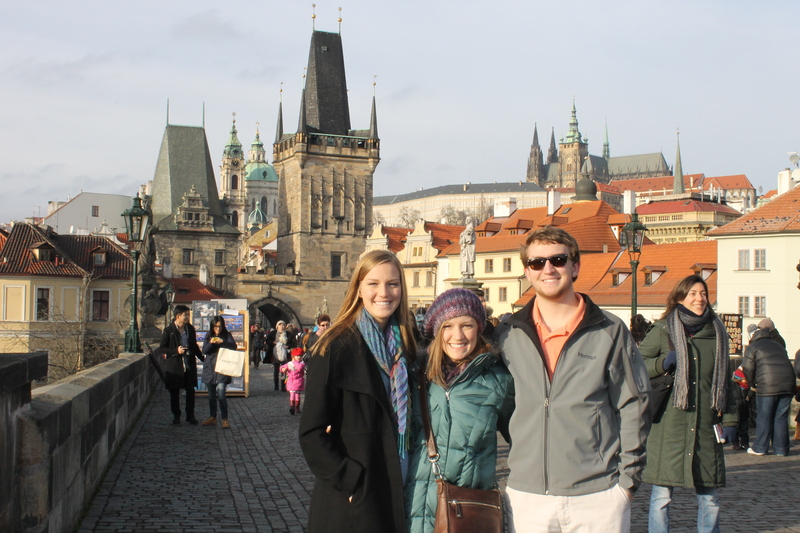 On the way there, we were almost knocked out by a low-flying swan on the Charles Bridge. I am not even joking. We were admiring the beautiful groups of swans skimming the river, when all of a sudden my mom saw something in her peripheral vision and luckily got me to duck when a huge, seemingly asthmatic swan flew inches over our heads! My life flashed before my eyes. Anyway, we got lost again on our way to the tour, which it turned out started right from where we had ended up the previous evening but hadn’t known where we were. The tour was definitely way overpriced; we learned some interesting facts about Prague and the Czech Republic during WWII, but since the 26th (St. Stephen’s Day) is a national holiday in Prague, a lot of the sites the tour would have normally seen were closed. Shortly after our first tour ended, we met up with the rest of the family and our sweet tour guide who would be with us for the next 2 days! I am forgetting her name right now, but she’s a few years older than me and native to Prague. She showed us so many interesting things in the city and just knew so dang much about everything! Later that afternoon we spent all our time at the castle, which is up on a hill overlooking everything.The cathedral, St. Vitus, is part of the castle complex and is the huge gothic building that overtakes most of the castle skyline. It’s absolutely gorgeous inside! We also saw the old castle building, as well as the very first Romanesque church built on site, and Golden Lane, a small strip of old (tiny) houses where working-class people from the castle complex used to live. Later on, Franz Kafka lived in one of the houses! Now there are a bunch of shops there, as well as an exhibit about armor and weapons through the ages. After we had made it through everything at the castle, we were incredibly hungry and slowly becoming hangry (mostly me, but everyone else was slowly approaching this point) so we started the long and treacherous journey towards finding a restaurant that fulfilled everyone’s culinary desires, did not smell like smoke, and actually had room for 5 people. Eventually we found a place that would serve German-ish food (though our waitress was terrible and basically tried to fleece us… she brought the 3 of us who ordered beer LITERS of beer, though we noticed that everyone else around us had gotten regular, human sized beverages). Luckily, the Schnitzel and Apfelstrudel was good enough to make up for it! The next day, the 27th, we went with our tour guide to Old Town, specifically the Jewish quarter. We saw several important demonstration sites during WWII and the time of Communism, which my mom and I had seen on our tour as well. We also saw several different synagogues — one of which has been turned into a Holocaust memorial of sorts, where the names of the thousands of murdered Jews are painted on the walls. The Spanish Synagogue was particularly beautiful… incredibly ornately decorated! 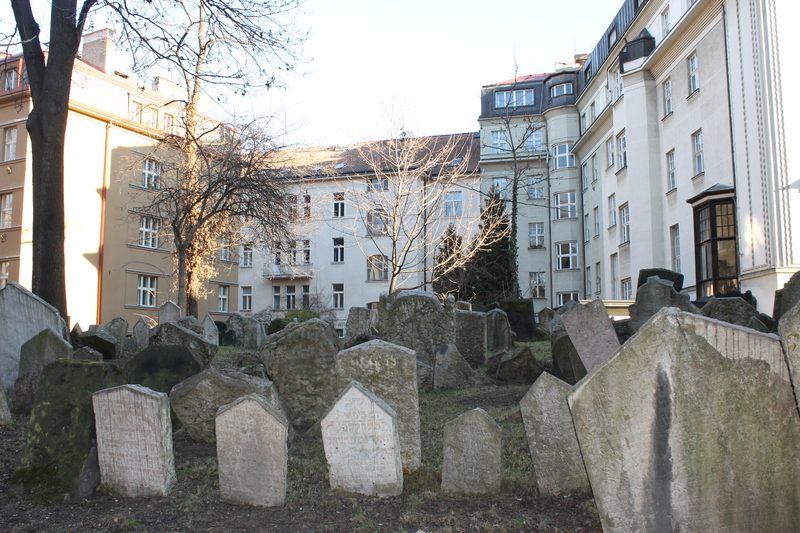 And we saw the Old Jewish Cemetery, in which 12 layers (let’s call them “generations” instead… sounds less morbid and graphic) of deceased Jews from Prague are buried. The headstones all seem so randomly and haphazardly placed! We walked through Old Town Square again, seeing the big church on the edge, whose name I forget right now, which really was stunning, and we saw the neighborhood behind the square which dates back to medieval times. It was one of my favorite parts of town, I think. One of the churches back there has a man’s shriveled hand hanging from the back wall, which supposedly belonged to a thief who tried to steal the gifts that people had bestowed on the statue of Mary. The statue grabbed his hand and wouldn’t let go, so they had to cut his hand off, and now his hand serves as a warning to anyone else who would steal from the church! That’s not why this was my favorite part of town. It was just a really quaint area. We made our way to Wenceslas Square, where we said goodbye to our sweet tour guide and hopped on the tram, which took us back up to the castle. The rest of the family went on a tour of the old palace of the Lobkowicz family, an old noble family of Bohemia. I was running out of steam at this point (go figure that I would be the first one to shut down… haha) so I headed back to the hotel and took a quick nap before dinner. 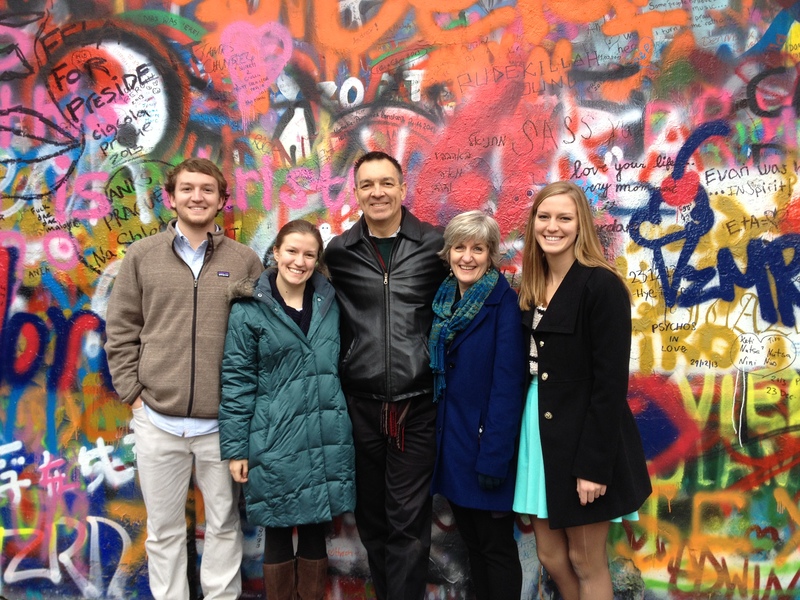 We saw the Lennon Wall earlier in the week and I forgot to mention it! We didn’t sign it, but we did run into some fellow Longhorns! So we can pretend that their inscription of “Texas Forever – December 2013” was also ours. 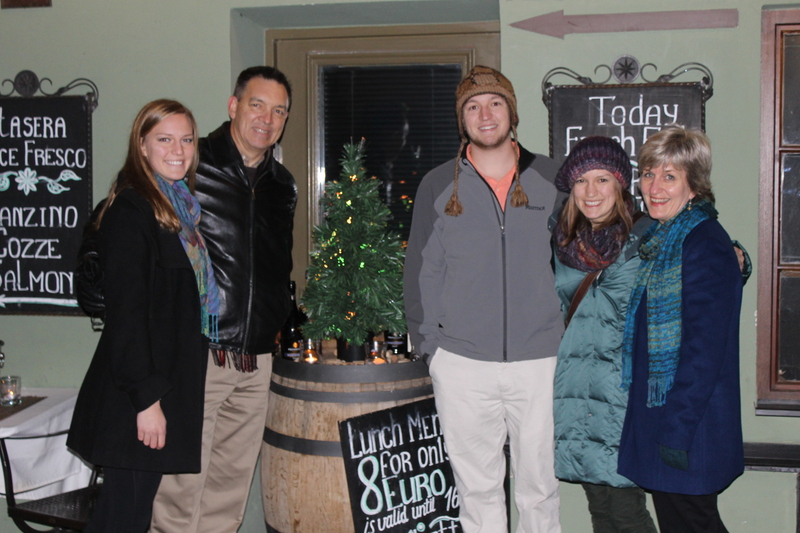 We ate at the brewery/restaurant of the Strahov Monastery, just uphill from our hotel. We all agreed that it was the best combination of good food, fair prices, and good service of the whole week. Their beer was, unsurprisingly, the best part. We did have to eat outside (inside was too smoky and also full) so we enjoyed the brisk weather and unexpected fireworks from the patio. The next day was Saturday, our last day in Prague. 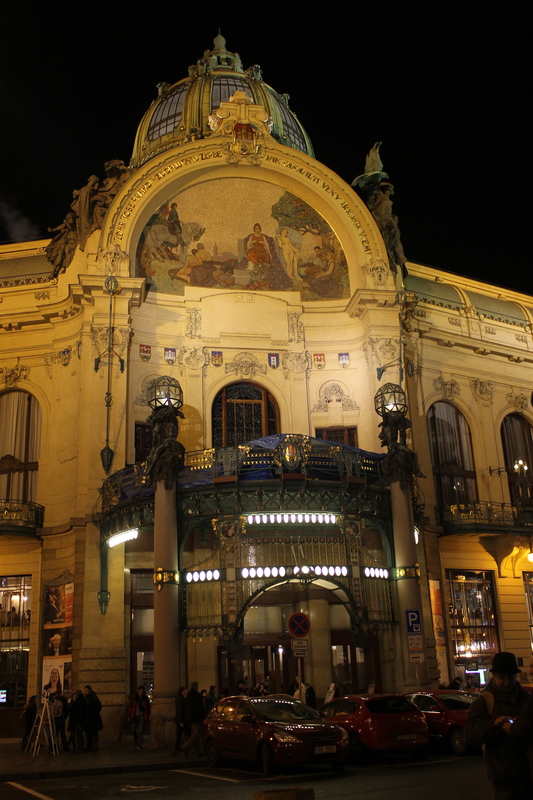 The boys went on a day trip to a surrounding town while the girls stayed in Prague, did a little shopping, and leisurely made our way around town to take more pictures and enjoy the scenery. When the boys returned, we played a few quick games of Spades, another family favorite game, before heading to a pizza restaurant I had scouted out earlier that week. I was really itching for some pizza, and the place we went was really great… just around the corner from the astronomical clock AND right down the street from the mystical souvenir shop we’d been looking for all week! Overall, the week was wonderful! It was great to spend time with my family. They are pretty cool and make great sightseeing companions! 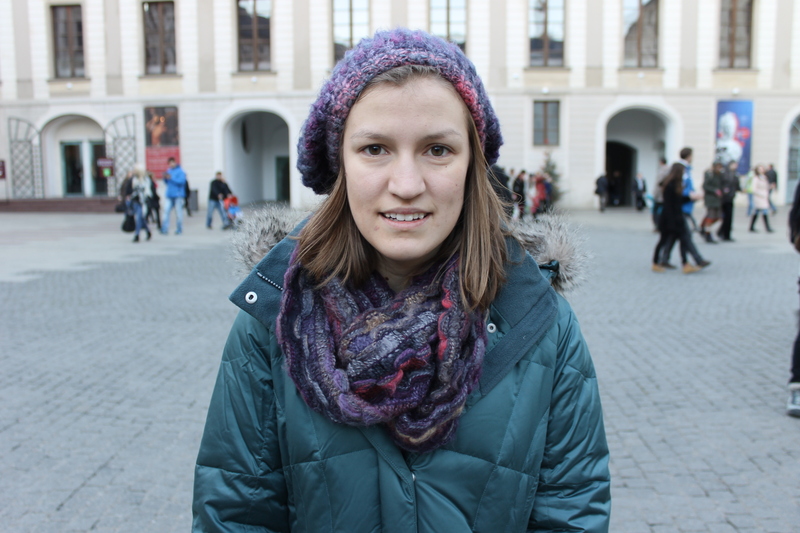 I now feel like I’ve seen everything Prague has to offer… on to further adventures! This year, I will be traveling to Spain (Madrid and Salamanca) to see Daniel, Rome for the canonization of John Paul II (yay! ), Amsterdam and other NW-European cities (Bruges? Paris? We’ll see) with my BFF Laura when she visits in May, possibly Greece for a conference, and hopefully Scandanavia with Felicitas–we both want to go so badly!! I guess that brings me to one last topic…. I have been posting sporadically the past few weeks partly because I’ve been busy and partly because I’ve been incredibly burned out on blogging. When I do summon up the brainpower and energy to write a blog post, the things I find myself wanting to write about tend to be observations, attitudes, and experiences that I would rather internalize and keep to myself. I know that makes me a bad blogger! So for now I am switching to journaling for the day-to-day stuff… but don’t worry, I’ll continue to write blog posts about my travels! ← merry christmas / frohe weihnachten / veselé vánoce! Thanks girl! I was surprised at how well it turned out, too; I was mainly frustrated at my sister for taking so many pictures when I really just wanted to take a nap! But we were pleased with how artsy it came out! Well then, Ryan and I will have to fill you in on the Ossuary (I.e. Bone Church) in Kutna Hora. Ornately dEcorated with skeletal remains from the Middle Ages. Why do vacations fly past so quickly? Great post Annie! 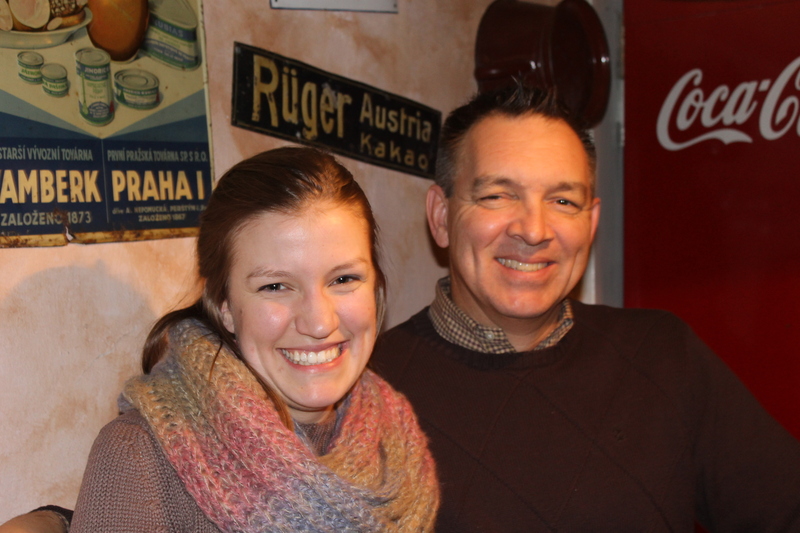 Our tour guide Lenka really made things enjoyable and efficient. Both the Strahoff monastery Library and brewery were exceptional. 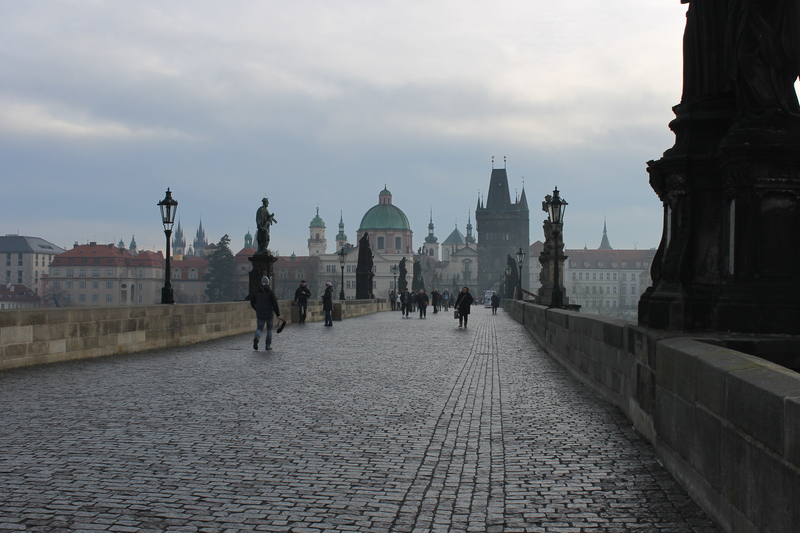 The Christmas atmosphere of Old Town and walking across the Charles Bridge were magical. The special highlight for me was the Prague castle overall and Lobkowicz palace museum specifically. Just an amazing living history marking 500 years for a single noble family. 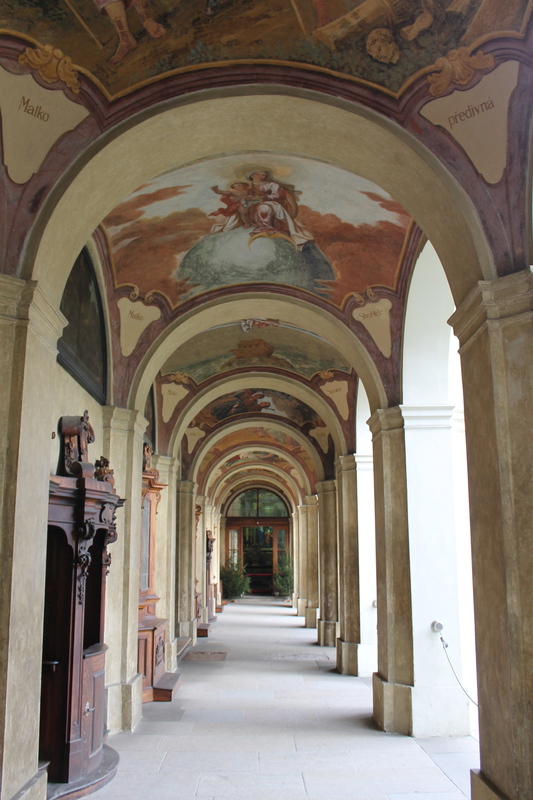 Yes, I realized my omission of the Strahov Library shortly after posting…. definitely a must-see as well! Absolutely gorgeous.